Timberlea Steel specializing in flat rolled carbon steel. Our company was founded in 1984 on the basis of exceeding customer expectations through quality products and excellent service. 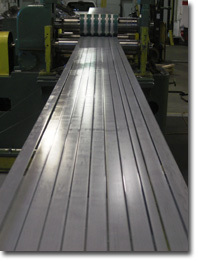 We specialize in prime and excess prime cold rolled, hot rolled and coated products. Located in Burlington, Ontario, we furnish slit coils, cut-to-size blanks, cut-to-length sheets, and master coils throughout Canada and the United States. We service a diverse group of industries, including construction, industrial packaging, material handling, office furniture and general fabricators. We can support stocking programs as well as meet any needs that may arise on a spot basis.